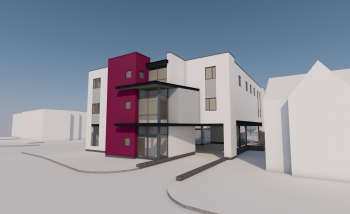 The pioneers of the IVF artificial insemination process, and brp architects client, Bourn Hall Clinic, have today released a press release in anticipation of the imminent start of the construction of their new IVF Clinic in Wickford. “One baby a week is being born following IVF treatment at Bourn Hall’s [existing] Wickford Clinic. The little clinic has just marked its 3rd birthday by announcing that it has achieved 120 pregnancies and that plans are progressing for its new building. Baby Jake Tompkins was one of the first 80 to be born. “Plans are being made for a new full service clinic in Wickford, which will be the only purpose built facility in South Essex to treat both NHS and self funded patients. “Design of the new clinic is based on nearly 40 years of experience in IVF and brp architects have been working closely with Bourn Hall to create a distinctive building with a welcoming interior that creates a sense of wellbeing and confidence alongside the highly specialised clinical treatment spaces. “Company director and project architect Alan Sankey enthused: “We have welcomed the opportunity and challenge of working alongside Bourn Hall and their development partners HPC, to create a first class facility. Wickford was earmarked as a natural location for expansion of Bourn Hall’s services, and although the chosen site has not been without it’s challenges, the finished building promises to be rewarding both architecturally and for all those who will use it.